A simple but comfortable and tastefully furnished settler’s holiday home, built in traditional coastal materials, set in mature gardens overlooking the ocean. Although a single storey house, there is a large relaxation area upstairs under the makuti roof. The house makes the perfect out-of-town beach holiday getaway. Situated on a cliff at the north end of Kuruwitu Marine Conservancy, the house enjoys lovely views and gentle breezes. Tastefully furnished and comfortable. 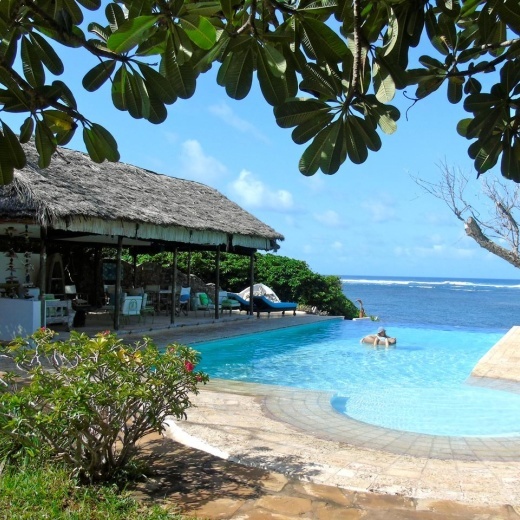 It has a mature garden and a fun sundowner deck just above the Indian Ocean. 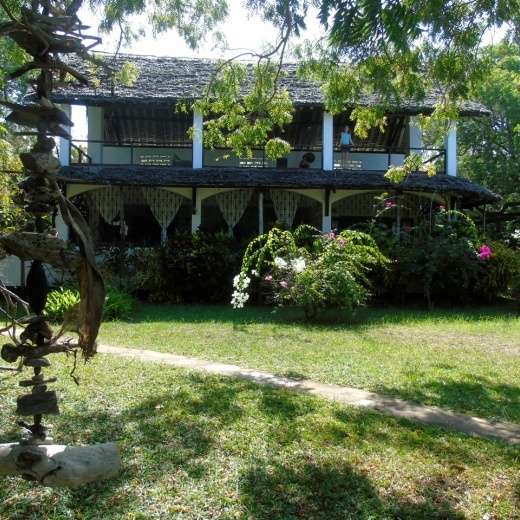 The house has 3 bedrooms that comfortably accommodate 6 adult guests. There are an additional 3 beds suitable for youngsters or adults willing to sleep in bunk beds or a small single bed in the master bedroom annex. All three bedrooms are air-conditioned. There is a gorgeous 12 x 6m infinity pool with a stunning pool house that has a bar with a drinks fridge, barbecue, dining and sitting area. There is a cook, a housekeeper and a groundsman. The house has good security. Staff quarters can accommodate one extra if required. Another 1 person can be accommodated if required at a small additional charge, although this is not encouraged as it is a strain on resources and the staff. Direct beach access at low - mid tide. Steps to beach relatively steep and not suitable for the elderly/infirm. Beach access at very high tide (for keen body surfers) or for elderly folk unable to manage the steps is only a few hundred metres down the road on the public access route. Fantastic snorkeling just off the beach. Also wonderful for reef exploration at low tide. Fresh seafood brought to the house by fishermen. A cooker, microwave, electric kettle, 2 fridges, freezer, blender, toaster and electric grill. The resident housekeeper is also available for baby sitting at an additional charge and with advance warning as she does not live on site. Vipingo Ridge golf course is less than a ten minute drive away. Kilifi is 20 minutes away, as is Mtwapa. Nyali takes half an hour. Everything was beautiful. We are going to for sure come back. The whole staff was really friendly. We could really trust them. During the day you can go for leisure walks but we ended just staying at the house all day because we were so comfortable. The best part of the house is the infinity pool. Gorgeous view into the ocean! The house staff, Emmanuel, Pili, Reuben ensured our stay was great! Will definitely be back!